When designing the layout, I wanted to take advantage of the Trackmobile’s smallness to squeeze the biggest amount of prototypical modeling in the smallest space. I also wanted it to be able to facilitate prototypical switching as well as be a puzzle layout. Thus, Whitney Textile (named after Eli Whitney, inventor of the Cotton Gin) was created. It measures 14in x 24in. As a straight switching layout, it is quite challenging. 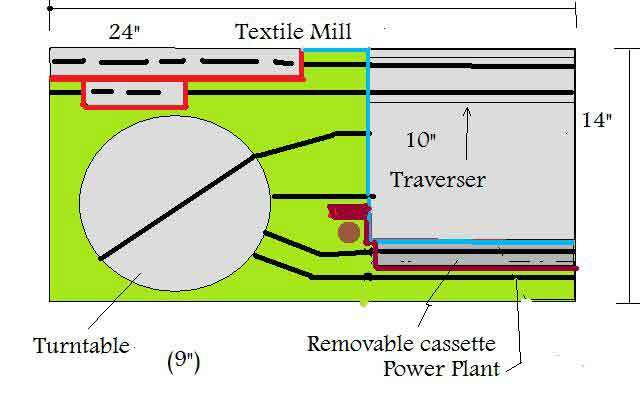 Cars are picked up from the removable cassette staging (tank cars of chemicals and dyes, boxcars of cotton fiber, loaded hoppers of coal and empty boxcars). The cars are then delivered to their various destinations to replace cars already there. I would recommend 2-6 boxcars, 2 tank cars, and 2-3 hopper cars. All rolling stock should be 40′ or less. 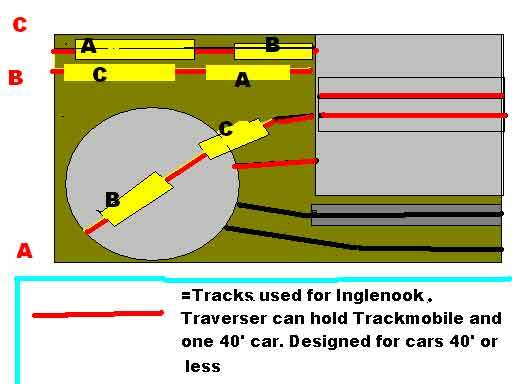 Whitney Textile can also be operated as an inglenook puzzle (see diagram below). While I enjoy switching prototypically (waybills and switch lists), I also enjoy switching just for the puzzle’s sake. The layout was designed to fit into a somewhat large brief case, but also be able to lift out and be placed in a bookcase. The plan can easily be adapted to a variety of other industries. As I will be going to college in a few years, this will make it possible to enjoy model railroading in the dorm room!